Political scientists and social theorists have long fretted about the Internet’s potential to flatten and polarize democratic discourse. Exposure to news and opinion increasingly occurs through social media. How social networks choose to filter and personalize our news feed influence exposure to perspectives that cut across ideological lines. Can we trust the algorithms they use? Or are they hiding relevant information from us? The composition of our social networks is the most important factor affecting the mix of content encountered on social media with individual choice also playing a large role. News Feed ranking has a smaller impact on the diversity of information we see from the other side. In other words: the filter bubble is your own damn fault. If you’re not seeing content on Facebook that challenges your personal views, it’s because of your own choices, not algorithm’s. This isn’t the first time Facebook research has angered the academic community. (1) Bakshy, Eytan, Solomon Messing, and Lada Adamic. 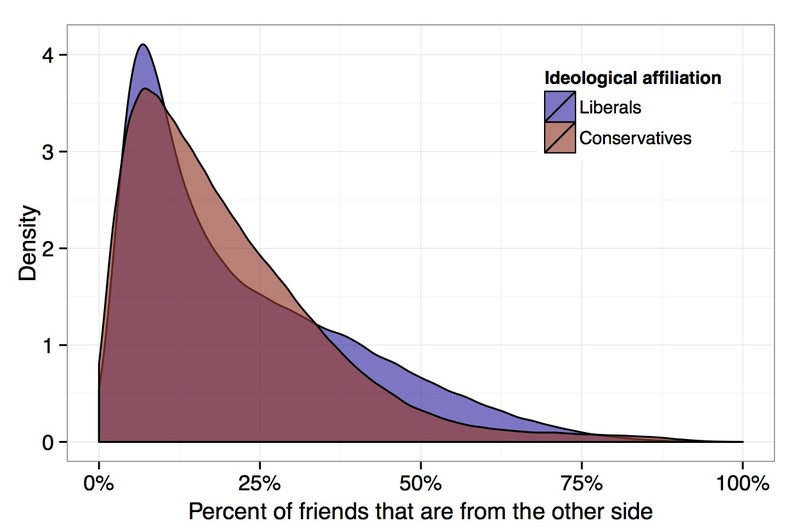 “Exposure to Ideologically Diverse News and Opinion on Facebook.” Science, May 7, 2015, aaa1160. doi:10.1126/science.aaa1160.